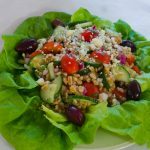 A healthy, high-fiber grain salad with delicious vegetables, fresh herbs and a light lemony vinaigrette perfect for a summer meal. For the vinaigrette, whisk together lemon juice, 3 Tbsp. oil, and honey; season with salt and pepper. Set aside. Measure the 1/2 cup farro into a fine mesh sieve and rinse with cold water. Drain. Transfer the farro to a saucepan and add the stock and salt to the pan. Bring to a boil over high heat. Reduce the heat to low, cover and cook for 25-30 minutes, until it is softened but still chewy. If there is liquid remaining in the pan, drain it off and save it to use with soup, stew or sauce. Use a fork to gently fluff in the butter or olive oil. Let stand for 5 minutes. Toss the farro, tomatoes, cucumber, red onion, parsley, chives, and cilantro with vinaigrette; season with salt and freshly ground pepper. For the best flavor let the salad stand 15 minutes or even better overnight. Arrange the salad leaves to form 2 bowls. Divide the grain salad between the two bowl and sprinkle with Gorgonzola and arrange the Kalamata olive around the salad. For a Greek taste: Brush 7 oz. halloumi cheese, cut into 1/2-inch-thick slices with 1 teaspoon olive oil. Grill covered, until it's heated through, about 2 minutes per side, then dice and add to the other ingredients and toss. Adapted: Cuisine Fast & Fresh Summer Meals for Two Summer 2016.